So, I’ve begun on this crazy trail that is illustration. What have I been up to? Well, a little book that I’ve called, “Where’s Mousy?” It’s a little book that I’ve written for my youngest daughter. Among all of the stuffed animals that she has floating around her room, and for reasons that I’ll never understand, she has attached herself to a stuffed mouse. This very loved animal has really ceased looking like a mouse. Originally, it had a christmas hat and looked like a very festive fellow. After lots of love, the hat is gone, as are any vestiges of Christmas. In fact, he’s beginning to look a little bit more like an elephant. Anyway, the story is a simple little board-book story where my daughter goes in search of her best of friends. 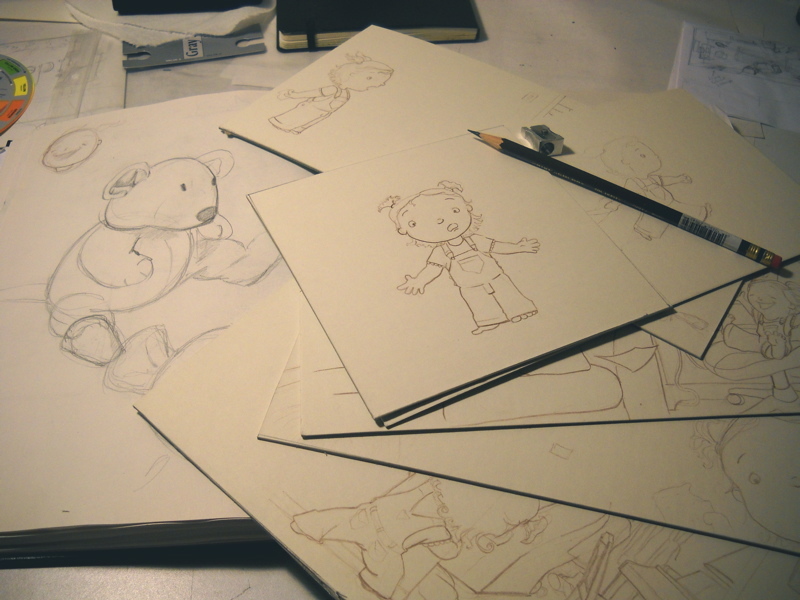 Above is a picture of the spreads drawn and a pencil portrait of Mousy himself. I’ll post more as I get them finished!